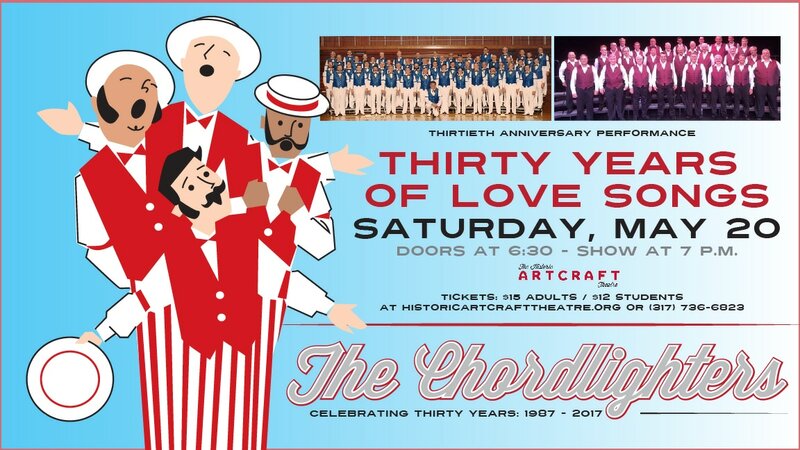 Celebrate The Chordlighters' thirtieth anniversary with an entertaining evening of upbeat love songs performed on the Artcraft stage. These performers draw a good crowd each time they bring their show to Franklin. Don't miss out on a family-friendly, fun live performance. The Chordlighters are a Barbershop Chorus composed of members from Greenwood to Columbus and surrounding communities. They are a chapter of the Barbershop Harmony Society formed in the 1980's from merging the Columbus and Greenwood chapters. Since then the Chordlighters have been a very active and dynamic group that takes pride in our performances and our quality of Singing. Please note, this event is not considered a movie event, thus gold, premium and basic membership ticket rewards are not eligible. Support the Artcraft with your Amazon purchases. Click here, and chose "Franklin Heritage, Inc." as your suggested donation recipient! You shop, Amazon gives, Franklin Heritage, Inc benefits!